May I take your order? This wooden tea set has everything your little one needs to host the perfect tea party: teapot with lid, two cups, two spoons, a sugar bowl, a milk pitcher, six tea varieties, and two cookies. Tea bags with brightly coloured tags store in a handy tea caddy and the wipe-off order card makes tea selection a snap! 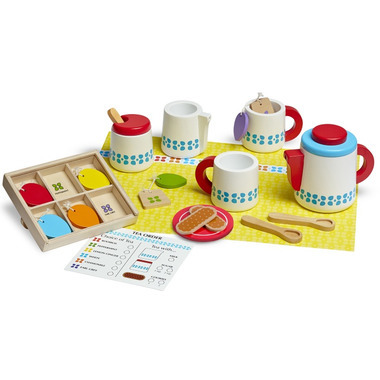 This adorable tea service encourages creative thinking and imaginative play and promotes memory and colour recognition. Who's ready for tea for two? My granddaughter received this as a Xmas gift and really enjoyed "making" tea the moment she opened it. Quality as always with Melissa and Doug. This was a gift for my three-year-old neices and they loved it the second they opened it. I love how simple it is and the beautiful wooden pieces! A wonderful set that has inspired many hours of imaginitive play. I love the attention to detail and the mid-century design, my daughter loves the tea bags and the cookies! This tea set has been a smashing hit with the children in our care. Would be great to be able to get a second plate for the cookies. Ty for a wonderful product! This tea set is truly adorable and one of the only gender neutral sets I could find. My boys love it and the quality is excellent! This tea set is perfect for our 2 year old. I like that all parts are made of wood and the little tea bags are such a great addition. I bought this tea set for my 1 year old (a bit early but I couldn't resist!). It's so adorable! Great wooden quality. I really like how it's not gender specific. She loves playing with the little tea bags. I can see this being a big hit when she's a little bit older. Highly recommend!